The ordinary rate delivery form: AW-DO-10 (48). 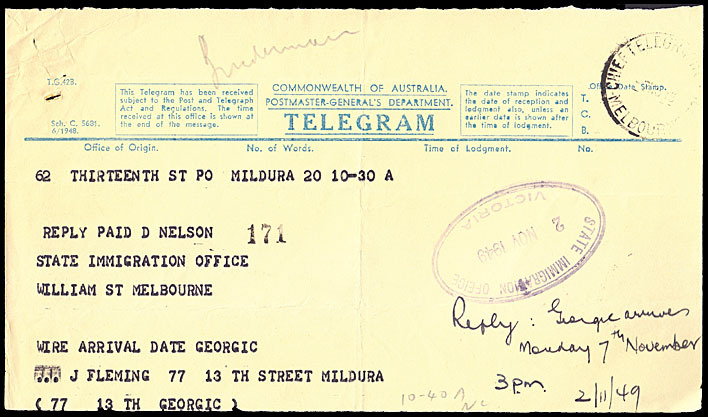 Heading and notes: 1948 printing: Form number T.G. 42. Message area: Blank with area occupying about 80% of form. Colours (text & form): Blue on yellow. Size of form overall: (A): 100 × 187 mm. (B): 115 × 197 mm. (BB): 101.8 × 215 mm. 10D: printed in a light blue-green colour. Printed in June 1948. AW-DO-10A (48). underline for PMG DEPARTMENT stops under "N". Printed in June 1948. AW-DO-10A (48) - same number as the form above. 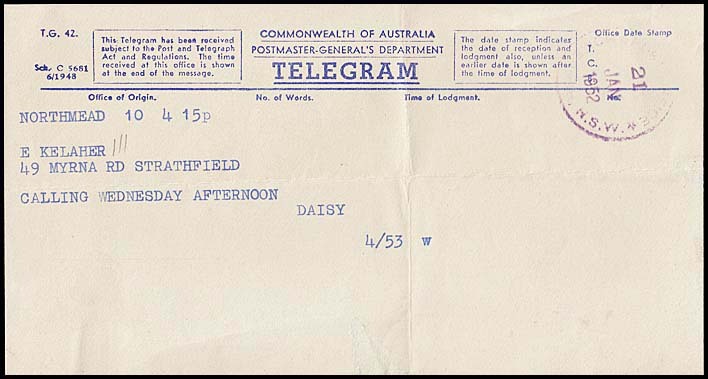 Northmead to Strathfield, NSW (21 January 1952). 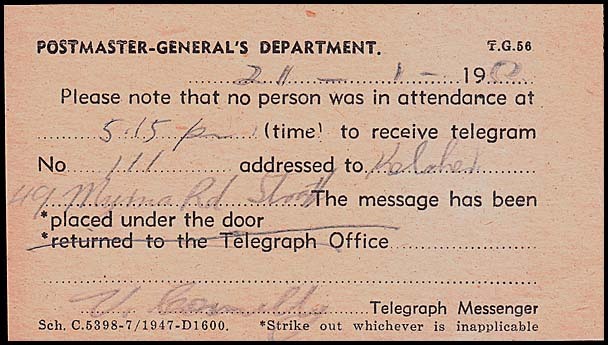 Is accompanied by the card below which indicates that, in the absence of any person at home when the messenger called, the telegram had been left under the door. Very rare to have both items still together. Note the number 111 on both which definitely ties them. Printed in June 1948. AW-DO-10B (48). DEPARTMENT is followed by ".".. Printed in June 1948. AW-DO-10BBa. 56 mm between boxes in heading. 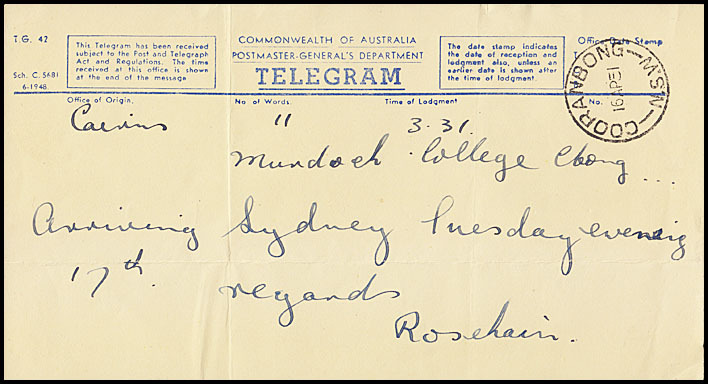 Form was improperly aligned and the top part of the heading of the next form is showing. Printed in June 1948. AW-DO-10BBb (48). 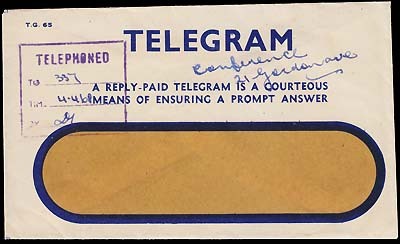 Scarce Waverley Telegraphs rubber date stamp. right shift of setting for both "Time..." and "No." under dividing line . Printed in June 1948. AW-DO-10C (48). 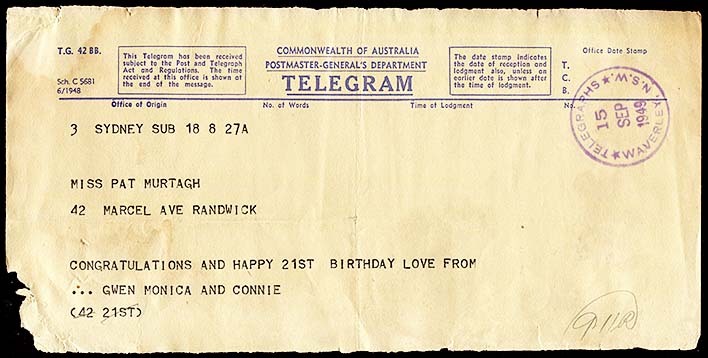 Cairns to Cooranbong, NSW (16 April 1951). 60 mm between boxes in heading. 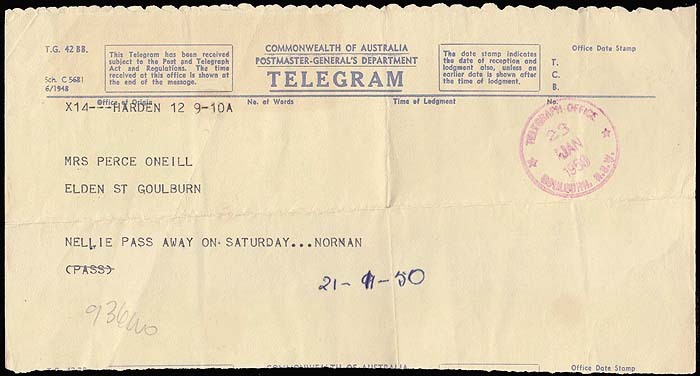 Delivery envelope used for Cooranbong telegram above. Printed in June 1948. AW-DO-10D (48). 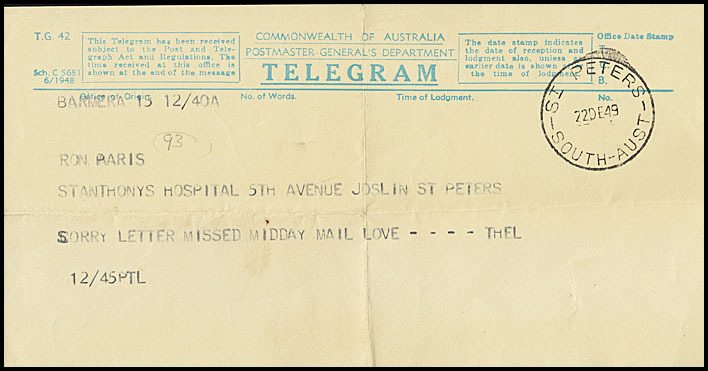 Bardera to St. Peters, S.A.
letters for TELEGRAM are more spaced. DO-10BBb (48) Sch. 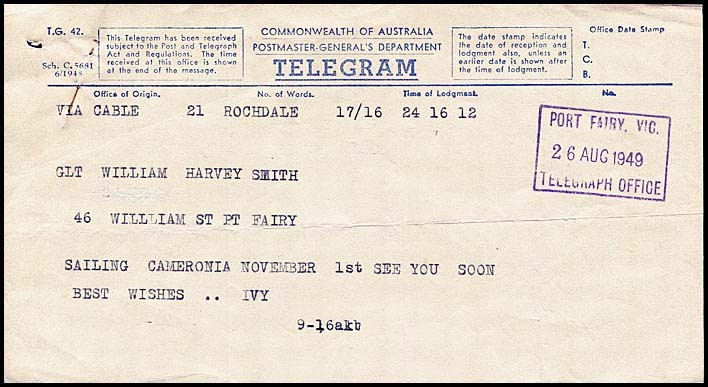 C.5681 6/1948 27 January 1950 at Rockdale, NSW. NC.